This section introduces a new concept: the behavioural axis. An 'axis' in this sense is simply a continuum between two opposites. To illustrate, imagine an axis between the opposites 'hot' and 'cold', which might look something like the illustration opposite. At the extremes of the axis are very hot and very cold temperatures, and as you move along the axis from one extreme to the other, a variety of different temperatures appear, each blending into the next. A behavioural axis is very much like this. The opposite ends of the axis refer to two opposite 'traits', and the axis itself represents the different shades and moods of the trait as we move from one extreme to another. There are as many possible behavioural axes as there are potential opposite pairs of traits, but most assessment systems use only a very few. This is possible because, by choosing particularly appropriate axes, a very wide-ranging picture of different styles can be built up. Different assessment techniques use different axes, but the basic principle remains constant. In DISC, two behavioural axes are used. These are the axis between Assertiveness and Receptiveness, and the axis between Openness and Control. 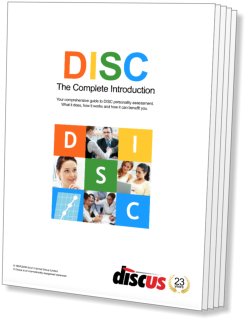 The meanings of these terms, and the way they are used to construct a DISC profile, are explained in the next sections.